The Saxophone Symposium is a scholarly, peer-reviewed journal devoted solely to the saxophone. A panel of professional performers, scholars, and pedagogues of the saxophone review all articles submitted for publication. Original, unpublished, research-based submissions in any category are welcome, including saxophone history, literature, pedagogy, jazz studies, contemporary practices, and interdisciplinary areas. Submitting materials for review, such as recordings, books, music, pedagogical materials, and other forms of media pertaining to the saxophone is also encouraged. Manuscripts should be submitted to the editor via email at the address listed below. Include a cover letter, which identifies yourself, shows the manuscript title, and certifies the manuscript as your own original work. The Saxophone Symposium will not consider any manuscripts that have been submitted simultaneously to another journal or that have been previously published elsewhere. Please note that submission length is limited to 8,000 words, inclusive of endnotes. In order to facilitate blind review, please remove your name, institutional affiliation, and any other identifying materials from the submitted paper. Manuscripts should conform to the Chicago Manual of Style, 17th Edition. In addition to Chicago Manual requirements, authors must include an abstract (maximum length: 250 words) and up to five keywords describing the essential topic and content of the manuscript. Authors are responsible for obtaining permission for reproduction of musical examples from music publishers. Where appropriate, authors will be asked to provide proof of permissions from the appropriate authorities. Please submit any questions about the review process, publication, and other concerns directly . One copy of the manuscript with identifying information removed (your name, institutional affiliation, or any other identifying information should be removed before submission), in .doc or .docx format. Please use one-inch margins, double-spaced text, endnote citations, and Times New Roman font throughout. Send an initial email to the Coordinating Editor of Reviews, , to indicate that you will be mailing materials for review and to request the appropriate mailing address. You will receive a confirmation of receipt via the email address you provide. Please email the Coordinating Editor for Reviews if you do not receive a confirmation of receipt within 2 weeks of mailing. NOTE: We have a team of pre-selected writers for reviewing materials, and thus The Saxophone Symposium does not accept unsolicited reviews. In order to be considered for publication in the 2019 volume, manuscripts are due by December 15, 2018. Materials for review are due by October 15, 2018. Questions about advertising in The Saxophone Symposium should be directed to the NASA Marketing Director, J. Michael Holmes at . Click here to purchase back issues of The Saxophone Symposium. 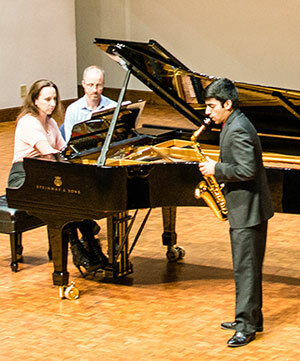 Click here for corrections from past issues of The Saxophone Symposium.